There are a ton of new features and improvements that will make DAP much more fun to use. We also have a whole bunch of new integration with 3rd party systems. Please do “Like” us on FB or Tweet this (just above this post) if you wish to show us your support! Thanks! So if you have a live web site with active subscriptions and members, then hold off on installing these until we release the FINAL version in about 3 weeks. All these new features, updates and integrations were based on your invaluable feedback – so thank you for that. 1. Our site has received a full makeover (new look & feel) :). Please check it out. 2. And NOW is a great time to promote DAP as an affiliate! DAP is now available for BOTH purchase and renewal as a subscription. You will earn ongoing lifetime recurring commissions for the subscription signups! DAP already had one-way integration with Infusionsoft. The integration was from Infusionsoft->DAP. But we have now completed 2-way full fledged integration with Infusionsoft. If you want to use DAP for your Membership Management and Infusionsoft for Email Marketing / Shopping Cart etc, then you can do that with either Infusionsoft->DAP or with DAP->Infusionoft integration. 4) DAP Payment Button (Paypal/CB/Authorize.net etc) => Infusionsoft Group – PAID Registration. If you want to use DAP for your Membership Management and OAP/Ontraport for Email Marketing, then you can do that with the very easy to setup DAP=>OAP integration. Users that sign up using DAP signup/registration form will be automatically added to the configured OAP/Ontraport group. 2) OAP/Ontraport => DAPUser that sign up using Ontraport/OAP signup form will be automatically added to the DAP membership. 3) DAP Paid Product => OAP/OntraportUsers that purchase a product using a DAP-Supported-Payment-Processor like Paypal, Authorize.net, Clickbank etc will be automatically added to the configured OAP/Ontraport group. If you want to use DAP for your Membership Management and arpReach for Email Marketing, then you can do that with the ‘very easy to setup’ DAP=>arpReach integration. 1) DAP FREE Signup => arpReachUsers that sign up using DAP signup/registration form will be automatically added to the configured arpReach form. 2) DAP Paid Product => arpReachUsers that purchase a product using a DAP-Supported-Payment-Processor like Paypal, Authorize.net, Clickbank etc will be automatically added to the configured arpReach form. If you want to use DAP for your Membership Management and Sendreach for Email Marketing, then you can do that with the very easy to setup DAP=>Sendreach integration. 1) DAP FREE Signup => SendreachUsers that sign up using DAP signup/registration form will be automatically added to the configured Sendreach list. 2) DAP Paid Product => SendreachUsers that purchase a product using a DAP-Supported-Payment-Processor like Paypal, Authorize.net, Clickbank etc will be automatically added to the configured Sendreach list. If you want to use Zaxaa as your shopping cart /affiliate platform and integrate it with DAP as your membership platform, then it’s a simple 3 step process for integration. 1) Enter your Zaxaa API Signature in DAP Setup -> Config -> Secret Authorization Key section. 2) Make sure your DAP product name matches the Zaxaa product name. 3) Set the IPN URL in Zaxaa to point to http://YOURSITE.com/dap/dap-zaxaa.php. That’s it. DAP integrates with both vBulletin 5.x forum and Xenforo forum now. We had completed this integration a couple months ago but we had not made formal announcement of this integration as it was still being tested.DAP integrates with Xenforo, vBulletin, and all other free WP plugins like BBPress, SimplePress, Buddypress, Mingle etc. The integration with Xenforo and vBulletin is full fledged – you can control who gets access to which forums based on their membership level in DAP. (Xenforo Integration – See this document for details. DAP now integrates with CCBill Payment Processor. We have added a new ‘CCBill Order Form Generation’ in DAP Payments=>Generate Buy Buttons->CCBill tab. You can generate the CCBill form code for your DAP Products, publish it on your sales page and when a user clicks on the payment button, they will get transferred to the CCBill site to complete payment. Upon successful payment, DAP will automatically create a membership account for the user and give user access to the downloads and protected content. – You can hook up DAP to Mandrill to send out Emails (EMAIL => SMTP) and have all of your emails go through the high-performance, high-deliverability Mandrill email servers instead of routing it through your webhost’s email servers. – With Mandrill, you need to use port 465 and SSL as Y. Note: If the user’s access end date to the paid product is in the past, the user’s access to product is considered expired. Otherwise the user is considered active. GetResponse Integration We have added some new really cool integration options with GetResponse. DAP has a feature called product chaining where you can set up rules to automatically remove users access to a product when they get access to another product in DAP. Now we have taken it one step further with GetResponse. You can now do product chaining between DAP and GR. When users upgrade to a higher level product or downgrade to a lower level product in DAP, the chaining rule will also trigger calls to GR to automatically move the user to the right list. For e.g. when a user upgrades to a PAID product from a FREE product, chaining rule can not only automatically remove users access to FREE product in DAP but also move user to the right group/list in GR. The cool thing is… GetResponse does not force a double-optin (unlike some other autoresponder systems) even if the subscriber is added via APIs. Clickbank Automated Login After PurchaseIn this release of DAP (4.6), we have also automated login to DAP membership right after Clickbank purchase. The buyers will be automatically logged in to their membership after purchase and you can redirect users wherever you want after they are auto-logged-in. Please NOTE: the users will get auto-logged when they hit the ‘Complete My Purchase’ button on the CB page after they complete purchase. But even if the users decide to abort and do not hit the ‘Complete My Purchase’ button, the great thing about this new feature is: DAP has a backdoor to make sure the user account gets created automatically (for successful purchase) and you do NOT have to handle the user creation manually. In this release of DAP (4.6), we have automated CB->DAP refunds and cancellations. If a customer contacts you to request a refund or cancellation, you can initiate a refund or cancellation ticket from within your ClickBank account. 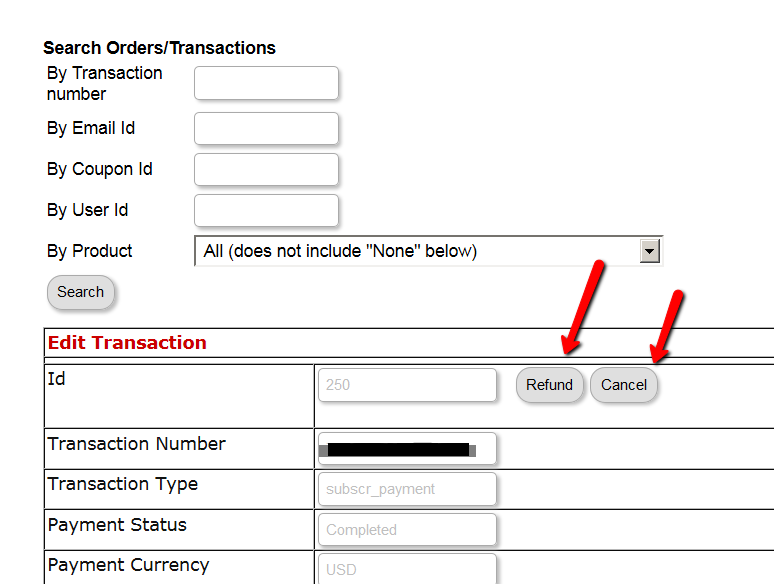 No action needed in DAP.When you complete a refund in CB, DAP will automatically create a new negative transaction in the Orders table. Then it rolls back user’s access to product.If you are using the DAP Affiliate program, then DAP will roll-back any affiliate commissions earned on that sale and make a negative entry in the database for that affiliate. If you are using the CB affiliate program, then this is not relevant, as there will be no aff comm in DAP.Upon CB cancellation, DAP will automatically apply action defined in DAP Products Page -> Cancellation & Expiration tab. In this release of DAP (4.6), we have also automated login to DAP membership right after JVZoo purchase. This is a unique integration that only DAP has where your users do NOT have to take any action after a purchase for automatic account creation or auto-login. The buyers will be automatically logged in to their membership after purchase and you can redirect users wherever you want after they are auto-logged-in. Please NOTE: the users will get auto-logged when they hit the ‘Access My Purchase’ button on the final receipt page after they complete purchase. But even if the users decide to abort and do not hit the ‘Access My Purchase’ button, the great thing about this new feature is… DAP has a backdoor to make sure the user account gets created automatically (for successful purchase) and you do NOT have to handle the user creation manually. Warrior Plus – Keygen implemented! In this release of DAP (4.6), we have also updated dap to automatically display login credentials to the user on the final thank-you page upon purchase. Users will no longer have to wait for their email to login. Just set the Warrior Plugin keygen url to point to the dap keygen script. DAP now supports Warrior Plus -> Stripe integration as well. DAP Admins will no longer have to login to Authorize.net or Paypal to cancel a user’s transaction. Click on the transaction Id hyperlink in DAP Users->Manage page to get to the edit transaction page. If a payment transaction is from Paypal or Authorize.net, you will notice a new CANCEL button right next to the Refund button in DAP Admin -> Edit Trasactions page. Upon cancellation, DAP will automatically apply the action you define in DAP Products Page -> Cancellation & Expiration tab. DAP will not only cancel the transaction within DAP and 3rd party systems (integrated in dap products page -> notifications tab) but also CANCEL payment in Paypal/Authnet. If you do not want this feature to be enabled, then you can turn it off in /dap/dap-config.php. DAP Admins will no longer have to login to Paypal to refund a user’s transaction. Click on the transaction Id hyperlink in DAP Users->Manage page to get to the edit transaction page. If a payment transaction is from Paypal, then when you click on the refund button, DAP will not only refund the transaction within DAP but also refund payment in Paypal. If you do not want this feature to be enabled, then you can turn it off in /dap/dap-config.php. You can now provide your users with an easy way to cancel their own subscription. If the users cancel it themselves, no admin action will be required. DAP will automatically cancel their subscription in Paypal / Authorize.net and also apply the action you define in DAP products -> Cancellation & Expiration tab to the user account. 1) No action – let the users access expire naturally at the end of current recurring cycle. 3) Set Access End Date to Previous Date – the users will instantly lose access but the row will remain in dap users->manage page. This way you can still see what products the user has/had but the access end date will be in the past so users can no longer access content. 3) Set Access End Date to Previous Date – the users will instantly lose access but the row will remain in dap users->manage page. This way you can still see what products the user has/had but the access end date will be in the past so users can no longer access content. Only applicable to Paypal, Authorize.net, Clickbank and CCBill cancellations. You can use this shortcode to show ALL transactions (it’s just a dump of user’s transaction history. Shows every single transaction for the logged-in user). Currently only one transaction template is available (template1). You can use this shortcode to show an ‘invoice’ link for user transaction. When the users click on the invoice link, a new window will open where the invoice will be displayed in pdf format. Say that you have an update billing info page where you allow your users to update their Credit Card info (See this document for more on update CC / Profile interface). Now you can use this new shortcode to only show the ‘click here to update CC/Profile’ link in the user’s profile page if they have an active Authnet or Stripe transaction. [ DAPShowCCUpdatePage payment_gateway=”authnet” displaymsg=”Click HERE to Update Your Credit Card Info“] [/ DAPShowCCUpdatePage] . Set payment_gateway attribute in the shortcode to stripe if you use stripe for payment. Set it to authnet if you use authorize.net for payment. : Show content to a member who has currently signed up for ANY product (1 or more, recurring or one-time) and whose access to those 1 or more products (recurring or one-time) has since expired. We have now made the post-login landing page for DAP Admins – a configurable option. – If you click on “DigitalAccessPass” link in WordPress admin menu, then you will always enter the DAP admin area. – So basically where the DAP admin is taken to – DAP admin home or member home page – after logging in from regular DAP login form, is now configurable. It now shows active and expired signups per product. 2) Export users by selecting user status or user’s product status. NOTE: Default set to “ALL” (if set to ALL, user and product status are ignored and users are exported regardless of user or user-product status). 4) Export just unique / distinct user records (one row per user even if user has multiple products) OR retrieve all user-product rows for a user (if user has multiple products, multiple rows displayed per user).Default set to “Just User Data”. So, we hope 4.6 was worth the wait for you :-). We would love to hear your thoughts, so don’t forget to leave a comment (or two) below. NOTE: If you don’t see the latest files in the member’s area, that’s probably because your 1 year of free access to DAP Support & Upgrades have expired, and you can renew here. If you think you should have access to DAP v4.6 and LiveLinks v1.10, then please open a ticket and we’ll take care of it. Thanks! These look like some great upgrades as always. It’s awesome how you are always improving this product. I was REALLY hoping for an overhaul of the affiliate system on this release… maybe next time? Looks like another great release, Veena and Ravi! I love that you’ve been able to finally tackle some of the more complicated system integrations (like Infusionsoft). The refund processing within DAP will also be a huge help for those of us with virtual assistants who do refunds but don’t need to give access to Paypal now. p.s. I also love that you’ve turned DAP into a SaaS model – both for even more affordability for new members just starting out (the lifetime/1-year update is still awesome), and for affiliates like me to have recurring commissions on higher conversions. Looks great! Can’t wait until it’s out of Beta! Hello, wow you guys have been hard at work for 3rd party integrations! Thank you! Please tell me you also added column sorts for all headers on the main page and maybe other reports? Wow! You’ve been busy! I’m glad to see all the new refinements (even the ones that don’t really affect me). The extra Clickbank integrations look great and I can’t wait to implement it on my Clickbank-driven membership site! I’ll tell you the truth – I recently tried the Premise plugin for WordPress to power a membership site. While the clean and streamlined admin GUI was appealing, I couldn’t get the Clickbank integration to work. That and the fact that the vendor for Premise appears to have halted development of it (the Clickbank integration was stuck on beta) led me back to DAP, with the Premise plug-in landing on the pile of tried-and-discarded ‘premium’ WordPress add-ons. I never should have left. DAP has the flexibility and features I need and Ravi and Veena’s support is awesome. Their continued development and refinement of DAP is impressive in a world of orphaned software and disappearing author websites. For anyone queasy about being asked to actually PAY for a WordPress plugin, I say that while free is great sometimes (and I really appreciate many of the plugins I pick up for nothing including WordPress itself) more often than not you do get what you pay for. Programmers have to eat and clothe their families too, and if you’ve ever been exposed to what it costs to get custom programming done in the corporate world, then you know that what even the most premium WordPress add-on costs is a mere pittance. I’m very exited about the Ontraport Integration. Great features Ravi and Veena. Good work in making an already great product better! >> I’m very exited about the Ontraport Integration. < < Thanks Coen. The only thing pending with Ontraport integration is the IPN integration for subscription payments (if you use Ontraport to sell). Last time we checked, they notified 3rd party systems after the initial purchase but there was no notification upon subscription payments. If you find anything different from their support, let us know and we will be happy to integrate that too. If you use Ontraport for just email marketing, the integration from DAP=>Ontraport for both paid and free products works great. New version looks great. I am looking forward to using the new DAP features with my OptimizePress sites. AWESOME news and updates, thank you for all you do to make this better and better! How are you coming along with Facebook integration for login? The DAP Social Login / Social Signup (using Facebook) plugin requires DAP 4.6. We have introduced a new ’email aliasing’ feature in DAP 4.6. If you successfully authenticate or register using FB, your FB email will be aliased to your DAP primary email. You can ‘Connect with FB’ for 1-click DAP Login or Registration. Now that 4.6 is out, we are now focused on the release of this plugin. This plugin has come out really well and we can’t wait to launch it in about 2-3 weeks. You guys are amazing! Can’t wait to get the new features. Well done to you and your Team. Yay!! Support for us ClickBankers – THANK YOU! I’m not sure I follow you here: ClickBank makes us send people to the Thank You page after completing the Order Page. Where are you suggesting we send them instead? Surely if they abort then the purchase is unsuccessful? Does DAP create an account for people who abandon the cart? Great job, I was waiting for this before switching to Infusionsoft. Lots of other cool features here as well. Can’t wait! Fantastic Veena, thanks! You guys have thought of so much to make our lives easier. Nice to see the arpReach integration. I installed the new version on a few sites, just need to play with it more. I’m also set to test the RapidMailer plugin. Although it’s new, it looks like a nice plugin. Any chance you would be looking at that for an integration sometime in the future? I have also tried a number of other membership plugins, but came back to DAP. You guys are great at coming up with new ideas and have an active development plan, compared to some others that have just changed an interface, but added nothing new and exciting. Keep up the good work. Thank you so much for this new release – great work! I have a question about the DAP -> Infusionsoft integration. Is there a way now with the 2-way communication that I can send the password that DAP generates to Infusionsoft to include in a welcome email? Right now I have to send 2 emails, one from DAP with login information and one from Infusionsoft in a pretty format with other information. It would be nice to send one pretty email! Ravi, Veena, you have truly outdone yourselves this time. We’ll put hasExpiredAccessTo and all the PayPal cancel/refund options to use immediately after this comes out of beta! I can’t wait. So excited to see this release…yet again making DAP the class leader in my mind. Using the plugin system and the integration with just about everything means.. I can do stuff like.. Adds people to my auto responders.. Does all the usual membership stuff. I also use 2Checkout for some sites..
And normal paypal buttons..with coupons.. very cool. and lastly vbulletin and now infusionsoft. Also..keeping it separate from wordpress is a big plus…as it doesn’t crawl to a halt if WordPress does. There is no better system out there for sure… and I’ve used the very responsive support too. Congrats to you both.. DAP will continue to be the leader I can see a bright future. >>There is no better system out there for sure… and I’ve used the very responsive support too. Are you guys just showing off now? I mean, holy crap, that’s an update. Woohoo Veena! I’ll start testing these features this week! Terrific update. Lots of small tweaks to make our lives easier. I’m manually generating receipts to my members (who can write off the subscription as a training expense) at least 2-3 times a week! And with our move to Stripe, it’ll be useful to show the CC Update info just to Stripe users – thanks for that. I also like the Unique Users report. Been dying for an easy way to see precisely how many members we have at any point in time. With several different products – there’s overlap and our reports have been messy and low confidence. Request: I would like to see DAP show me on the Admin Home how many active Uniques I have for each of my subscription products. Request: Also useful would be a report showing me how many new subscriptions vs. how many new cancellations over a given time period. Please send us a list of everything on your wishlist for the admin report/stats. We are going to redo the admin report in the next 2-3 months. So your feedback and suggestions for improvement are very welcome. This new version already includes reporting on total unique users as well as unique members by product. It also shows you clearly which subscription products have how many unique members. Once you upgrade, see how it looks, and if you have any feedback, please do let us know via a ticket and we’ll certainly include it in a future release. It would be awesome if you would also integrate with Sendy (Sendy.co). In my opinion, the ability to incorporate Sendy’s service in conjuction with Amazon SES would make DAP a powerful low-cost leading contender for email marketing. Keep up the great work! Yes, makes sense. We came close to implementing Sendy integration in this release but turned out to be a lot more work than we expected. It’s certainly on our to-do list for future. What, if anything, must we do in order to make the ONTRAPORT>DAP integration work. Am setting up a deep ONTRAPORT integration for TheFresh20.com. While we’ll be using PilotPress to handle show/hide for pages and page content, client does want to be able to use the PDF protection that DAP offers. What must we do on our end (ONTRAPORT) to faciliate this integration for them? Also, how far off are you from taking this release out of BETA? If you want to use Ontraport to sell subscription products, it wont integrate with DAP because when we checked a few months ago, Ontraport does not send notifications (IPN) to 3rd party systems after successful subscription payments. If that’s not true anymore, we will take another look at the integration. But if you want to sell one-off products via Ontraport, you can integrate it with DAP. DAP 4.6 release is pretty stable now. We will take it out of beta next week. We are now getting ready to release DAP 4.7 beta! I love the changes to your site! It’s getting much easier to navigate around. I keep finding things out about DAP that I didn’t know it would do. Does DAP support PHP 5.4 ? I searched through the release history but didn’t see any reference to it. This release is looking really good! That would really be useful!